A clogged sewer line poses a lot of serious problems. If the problem comes from a kitchen sink pipe or a toilet, the issue might be just a clogged drain. But if every flush creates a sewage build up in your home, it is highly likely that the problem is in your main sewer line. Now, let’s talk about the ins and outs of how to unclog a sewer line without a snake. A clog in your main sewer line is commonly caused by improper waste disposal. Flushing tissues, napkins, diapers, and other solid waste materials down your toilet can cause major problems in the future. You might have to take them out by hand if your sewer line gets clogged. Also, do not pour grease down your kitchen sink drain. They harden easily due to the cold water running and creates a stubborn clog within your plumbing. Tree roots are another common cause of sewer backup. They usually grow into pipes and cause blockages. If your house is quite old, your sewer backup might be caused by broken, old, or collapsed sewage pipes. This is because old sewer lines were built using clay piping and cast iron, which can break down over time. One of the very first things you should do if the problem arises is to inspect and determine the cause of the problem. That way, you’ll be more prepared for how you are going to unclog your main sewer line. With proper maintenance and correct use of drains, a sewer problem can be avoided. However, if it does happen, you can always call a professional plumber to clean up your main sewer line. The caveat is that it comes at a high cost. If you want to save some money, you can do the job yourself by following these tips. Usually, a sewer snake is used to unclog pipes. It is a useful and inexpensive tool that is readily available at your local hardware store. If you do not have one, there are other ways you can clean up your main sewer line. 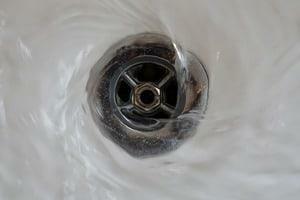 You can run hot water for 5 to 10 minutes to unclog a drain or pipe. If the problem is coming from the toilet, drain the tank and replace it with hot water. Flush and use a plunger, preferable a force-ball type to force the hot water down the pipeline. You can buy plenty of chemical cleaners from hardware stores and even grocery stores. Follow the instructions written on the container on how to properly apply the chemical cleaner to the clogged sewer line. A force-ball plunger is better than the regular cup-type because you can apply more pressure into the drain to eject the blockage. Make sure the toilet bowl has enough water. Plunge several times until the clog is gone. Find a clean-out plug and remove it. It is usually in the basement or near drainage lines connected with rain spouts. To help avoid making a mess on your basement floor, put a container or bucket just below the plug. The container will catch drainage forced back through the sewer line. Get a garden hose and attach a high-pressure nozzle to the end of it. If you don’t already own one, you can buy these inexpensive nozzles from any hardware or home improvement stores. Run as much of the garden hose into the sewer line through the clean-out plug until it touches the clog. Slightly turn the water valve on. Avoid running too much water immediately to prevent the rush of water back through the line. Gradually increase the amount of water as you move the garden hose back and forth. The high-pressure water can clear up the blockage. Continue until the sewer line is clear. A sewer trap serves many purposes. It is created to retain water every time the toilet or sink drains. That small amount of water remains in the bottom of the curved part of the trap. It performs as a barrier to prevent gas from the sewer to pass from the drain back into the house or any occupied building. However, it can cause a lot of problems if it gets damaged, used improperly, or not maintained well. You do not need a specific sewer trap plunger. Here are some ways you can clean your house sewer trap. Before you open a sewer trap, make sure it is not backed up. Always open the outside or street side of the trap to clean it up first. This will allow water to flow after the trap plug inside the house is removed, especially if there is a trap stoppage. The backed up waste will eventually run out. After this, you should remove the stoppage at the bottom of the trap. Cleaning up a sewer trap can be very messy. Remember to wear long rubber gloves before you begin unclogging. It requires handwork but removing waste materials by your bare hands and without protection is never a good idea. All drains in the house including the kitchen sink, bathtub, toilet, and others should be used at least once every few weeks. If you let the tap dry out, unwanted odors can creep into your house. But if you have to go on long vacations, make sure to shut the toilet off and empty the bowl. Put plastic over the drains. This video demonstrates how you can effectively clear up your sewer line by yourself, without using a sewer snake. That is how to unclog a sewer line without a snake. Although having one is easier, the alternatives mentioned above are just as effective. It is not that complicated to unclog a sewer line. And now that you have successfully done it, you do not have to call a professional plumber to do it for you. Remember that with proper use and maintenance of your drains, you can avoid problems caused by your clogged sewer line.